We’ve been hearing about a certain storm system for a week as it’s been slowly marching across the country from California, as the air drops down from the Arctic, and more moisture is drawn up from the Gulf. As with all long-term forecasts, there are too many variables to really be able to tell yet exactly what we’re in for and where our little house is located seems to be precisely where the meteorologists are drawing the line between 6″ of snow/sleet and 12″+ of snow. As is always the case, only time will tell. Regardless of what actually happens, this kind of system puts a buzz in the air. Getting ready for a potentially big storm is just part of living in this region of the world. Once we catch wind that something big may be headed our way, we all flit about, preparing as best we can. Stocking our shelves, running our errands, filling our gas tanks, packing emergency bags for the car, and keeping shovels & snowblowers at the ready — as with anything, the more you prepare on the front end, the easier it will be to deal with once it hits. Beyond the practicalities, though, everyone is energized with anticipation. In our house, we check the weather reports a couple times per day. My hubby and I (mostly) playfully bicker about which weather sites are more reliable. And the kids speculate as to wheather it’ll be packing snow or fluffy snow, whether we’ll get enough to build a mega snow fort, and if the sledding hill will be faster. I made a giant batch of waffles so the kids would have an easy warm breakfast, stocked up on warm food & drink like chicken noodle soup and hot chocolate, and I baked a big batch of chocolate chip cookies for — I’ll be honest — no better reason than I thought they’d be a nice treat. 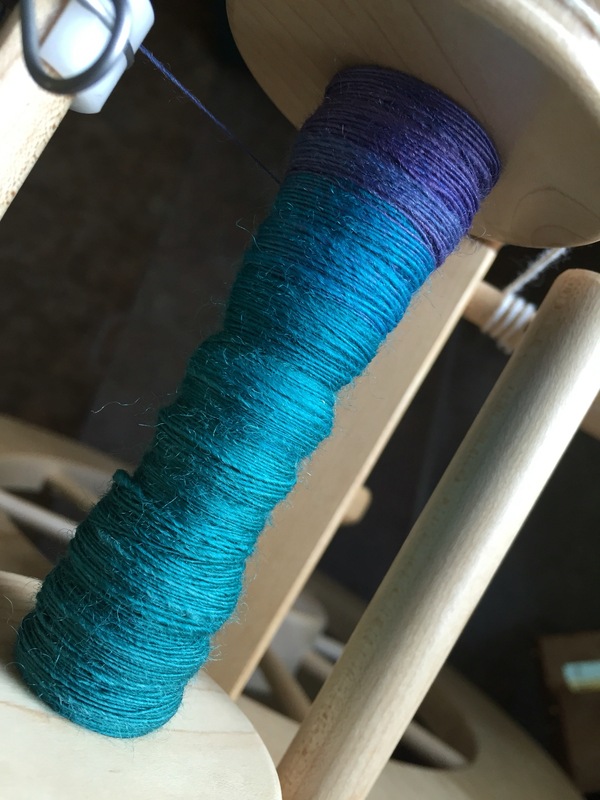 It’s been slow-going though because I’ve been kind of distracted by my spinning. It’s my first real run with my Very Fast Flyer and it’s taking some trial and error to get a good feel for it (as shown by the bursts of over-twisting). I think I’m probably going to do an n-ply, but I’m not 100% sure yet. I’m going to let them rest awhile while I consider my options. 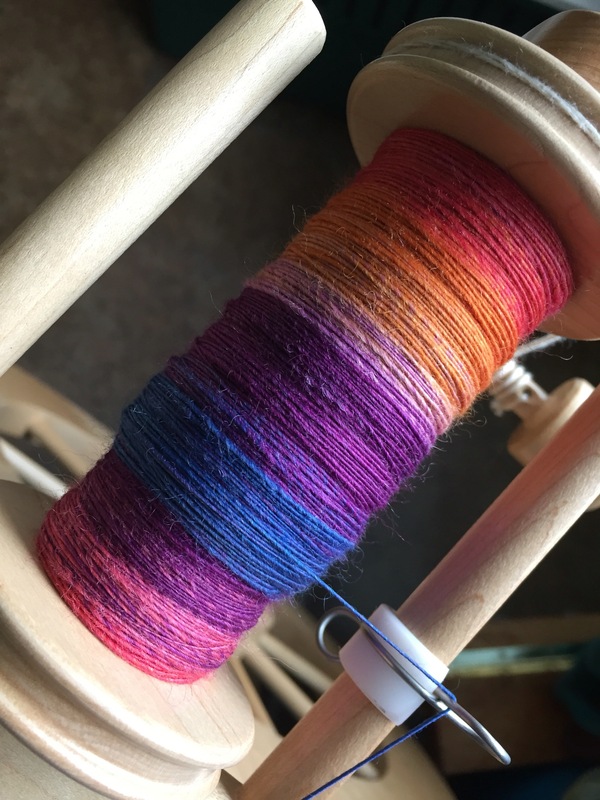 Three Waters Farm is the guest dyer for the Completely Twisted and Arbitrary Ravelry Group‘s January – March Spin-A-Long and I am excited to be joining in! This group’s SALs are a very neat concept — the dyer introduces a theme and then participants share visual media ideas to give color/illustrate the theme and for which the dyer could base some custom colorways. The dyer then selects a couple images and dyes the custom colorways. And then the group all spins them up! 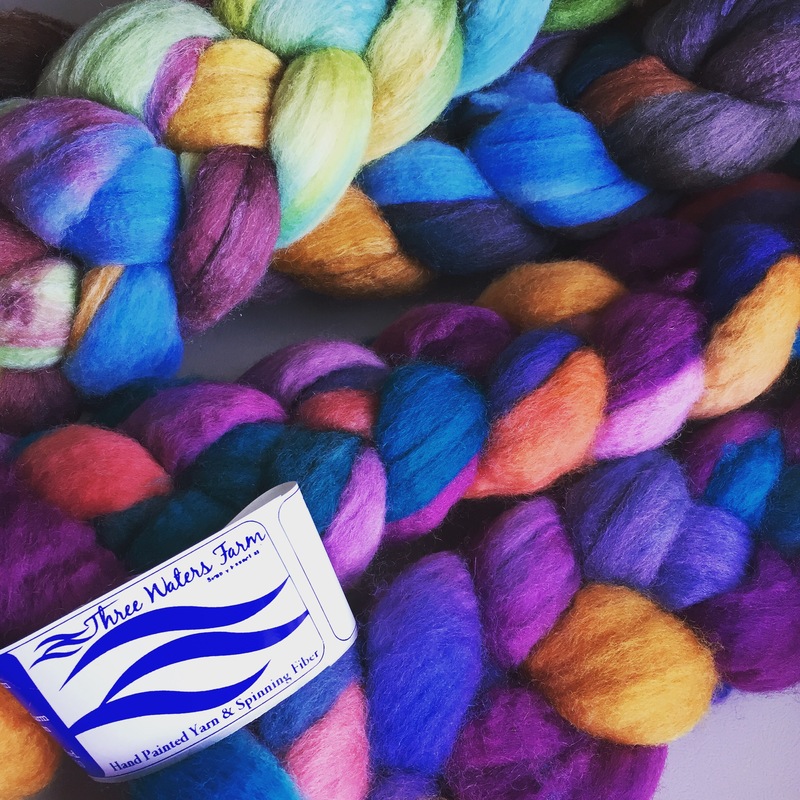 You can can see the paintings and custom colorways for this installment here — I think what Mary Ann from Three Waters Farm has done is just phenomenal — so much so that I starting spinning almost as soon as the fiber hit my doorstep. I started with “Color Music” inspired by Georgia O’Keefe’s Music, Pink and Blue No.2 dyed on BFL. And pretty quickly I knew it would be a struggle to step away. These colors are rich and intense and just incredible. And if that wasn’t enough, I swear the BFL is infused with some sort of magic because it is practically drafting itself. This spin is just pure joy. Pure, gorgeous joy. 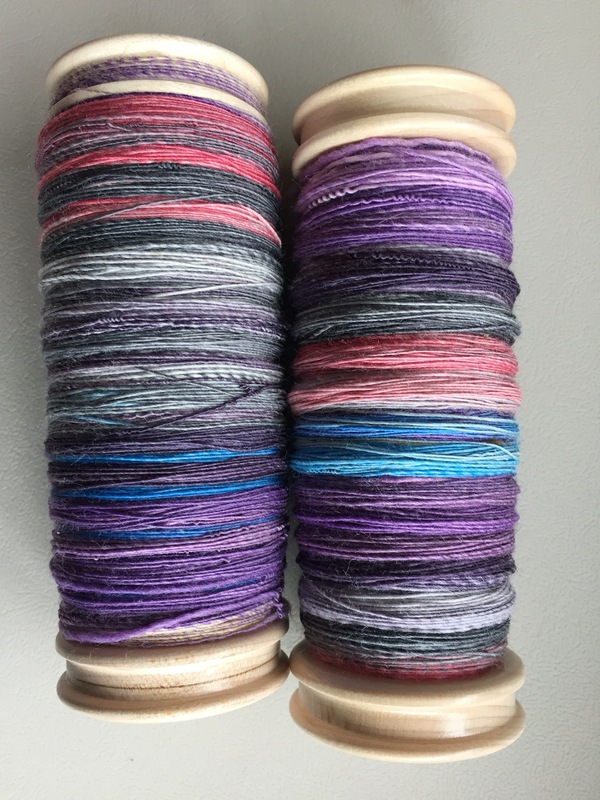 Should you be so inclined, you can still pre-order any of the Completely Twisted and Arbitrary colorways in the Three Waters Farm Etsy shop. All three exclusive colorways are available on your choice of BFL or Merino/TussahSilk 80/20. I really can’t say enough great things about them! So as we all wait for what may or may not be a Snowzilla-type storm to hit, I’ve got my flurry before the storm preparations finished. I suppose all that’s left is it stay calm, spin-away, and wait for the snow to start flying. 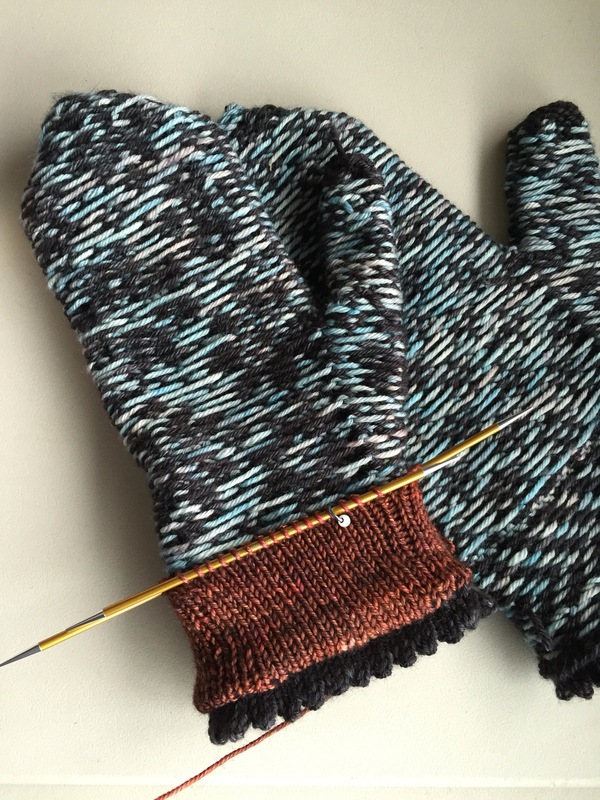 Beautiful fibers… Love your mittens. The worst of the storm is supposed to be south of us but you never know. Time will tell. Time will tell! We’re literally right on the line between getting maybe 6″ snow/sleet or a foot plus. It’ll just depend on temps when the snow starts falling. Thanks for the kind words — I really need to just buckle down and finish the mittens because I have a really exciting (at least to me!) project up next, BUT that fiber just has me captivated! We just were added to the blizzard warning area. Get ready…! We are in the exact same storm path as you. I’m absolutely doing nothing to prepare this time as it seems every single over-hyped storm has missed us to the north or south this year. Boo. Maybe if I ignore it we’ll actually wind up with some good powder. 😉 I would, however, love to spend the storm at your house–your preparations sound like fun! Enjoy the snow! (Fingers crossed of course). I was 100% in your boat of saying nothing is going to happen until my hubby & I got into a bickering match about it. For work, he has to make major scheduling adjustments when weather — or even the threat of weather — is coming, so I’m trying to be aware and… sensitive to all contingencies. I’m very hopeful for some good accumulation, BUT also hoping it isn’t bad enough to strand my hubby at the office! We’d certainly love to have you here — I made A LOT of cookies and waffles — lol! Total bust storm here! We are getting some thunder snow but it’s still not amounting to much of anything and we’re forecast to get rain after noon today. Boo! Hope you’re getting better powder!? It *just* started snowing here. It’s coming down pretty hard, but it looks really wet. We aren’t predicted to get much – we shall see! Ours is super saturated too. Kind of worried about limbs breaking. Wish I was a few hundred miles NW of here, we’d being getting dumped on. So true! Ours is melting today. 😦 I did get out to cross country ski though on Wednesday! Eeeep! Good luck with the storm; may it be the best snow ever for every activity imaginable! 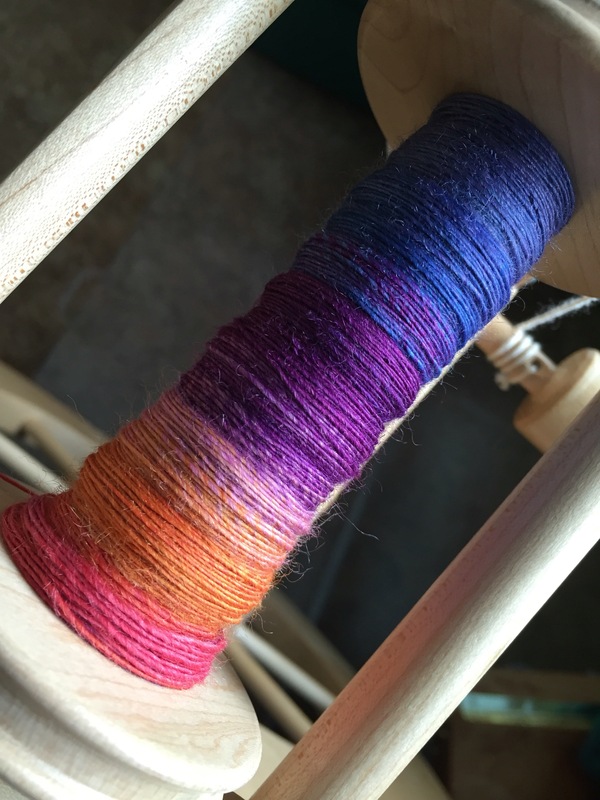 Your spinning is fabulous; I can hardly wait to see the finished skeins! Thanks! Honestly, I’m hoping for lots of powder. It’s easier to shovel than a snow/sleet mix! 😉 I can hardly wait to see the finished skeins either — this one is really special, Mary Ann! Those SALs are how I first discovered Three Waters Farm (and a few other lovely dyers). They really are a lot of fun to participate in. And I agree, her BFL is fabulous. They were on my hands when I walked the dog yesterday! We’ve had mostly glancing blows with storms this year – the “big” one I wrote of here only dropped about 5″ and since then we’re had an inch here and an inch there. I got out cross country skiing once which will be enough as my skis need some repairs! Glad you got to wear them! The good news is your daughter can only wear one pair at a time. 🙂 Our winter has been much the same. The most snow we have gotten since November was just under a foot last weekend. They say there is a chance of a couple of storms in the next few weeks, but they do seem to come across the middle and keep going straight out, not turning up the coast. Not helpful to our winter economy (plowing and skiing and snowmobiling) and there is very little ice that is safe for ice fishing, but as someone who has lots of things that need hand shoveling, I am OK with it for once! So true! You know, as someone with an old furnace that I am trying to eek out one or two more years with, I am not minding the mild winter so much either. We’re in for a cold snap here for about a week (which means no snow generally), but they it should be up around the freezing point again. We haven’t had safe ice either which is a bummer as my son was hoping to get out fishing with my dad. Even way north on Lake Superior the ice is no good — there’s an “ice road” they open annually that goes out to Madeline Island that isn’t going to open this year because there isn’t enough ice! I have been there – I hope your house is well insulated so that the heat you do get stays put! When you get the new one, you will be amazed at how much you save on fuel and how warm you are – I hope that you are able to do it sooner rather than later. When we moved, I insisted that we have more than just a furnace for heat. We kind of went overboard, with hot water heat, a pellet stove AND a wood stove in the cellar, but when it gets below 0 and the wind howls, we utilize them all. I know we are blessed to have them. I work in a community action agency, and we see thousands of people each year who need help keeping warm. We are all grateful for the mild winter (so far!) or their sakes. It’s one of those situations where we know we’ll save money and it’ll be way more efficient and we’ll be warmer once the new one is in, but just would prefer to make the investment in about a year if we can wait. Our a/c died last summer, too, (the furnace is almost 30years-old and I don’t know about the a/c) so ideally we’d just like to replace the whole sha-bang at once. My parents have a pellet stove and I would love to add that someday, but I think in our tiny house it might be more expense than it’d be worth. In the mean time though, we’ve got a couple small space heaters to help out when it gets really cold and — of course — there is no shortage of wool!